Winners will be picked weekly during the month of November through a random selection of Facebook, Twitter, Instagram and online nominations. This sweepstakes is especially fun because our fans get a chance to give a treat to their friends, as well as win something for themselves. Know someone who deserves free root beer floats for a year? A&W Restaurants invites you to nominate him or her in its second annual Float-A-Friend contest, starting Nov. 6, 2017. If your submission is a winner, you will be a winner, too, as you both will get complimentary floats for a year. Floats will be awarded in the form of A&W Bear Bucks gift checks. Winners will receive the value of approximately 52 floats, each for themselves and their friend (104 total Bear Bucks). 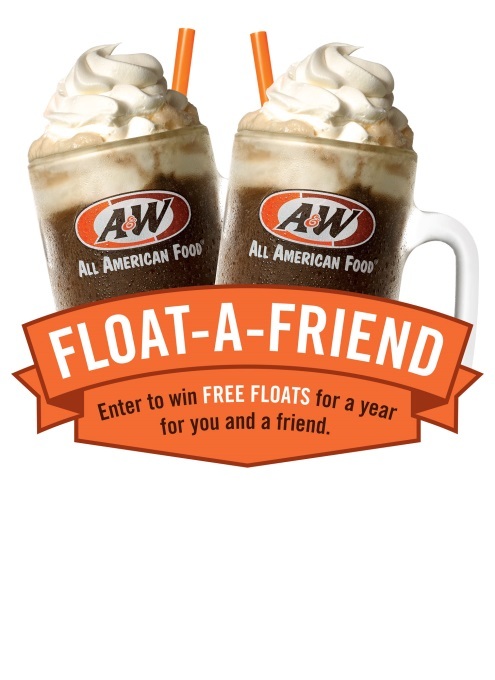 “We first ‘floated the idea’ of float-a-friend last spring, and it was so popular that we are bringing it back this year,” said Sarah Blasi, vice president of marketing, A&W Restaurants, Inc. In 2016, A&W launched Float-A-Friend as a one-month sweepstake for 50 winners. This year, it will run continuously. (or until the company runs out of root beer!). A&W’s floats start with a frosty cold mug of world-renowned A&W Root Beer, made fresh in the restaurants from real cane sugar, water and a proprietary blend of herbs, bark, spices, and berries using the original 1919 recipe. It is then topped with creamy vanilla soft serve.